This chance at change is sourced from pristine Australian springs, which means maximum refreshment. The best part? Every bottle helps get water, toilets or hygiene training to people in need. Our 1.5 litre bottle is a desktop essential (and promises to make you look and feel cool in the office). Our spring water is sourced from specially selected pristine Australian springs and every bottle helps get water and sanitation services to people in need. Woolworths, 7-Eleven & selected Independent Supermarkets. This life-changing bottle is great for hydration on the go – check it out at your fave cafes and supermarkets. Our spring water is sourced from specially selected pristine Australian springs. Plus, every bottle helps get water and sanitation services to people in need. Australia Post, Baby Bunting, Officeworks, 7-Eleven and selected Independent Supermarkets. Keen on making a bold statement in your corporate boardroom? Impress external guests and team members alike, with 350ml of life-changing water. Winc (formely known as Staples), Lyreco & Complete Office Supples (COS). 663 million people around the world don’t have access to safe water, yet the global bottled water industry brings in billions of dollars every year. At Thankyou, we realised the latter could form a part of the solution to the former. 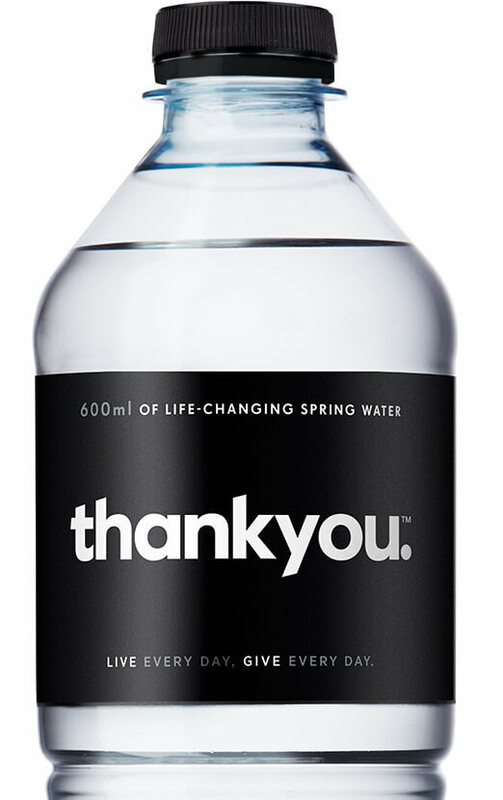 Every bottle of Thankyou water helps fund water, sanitation and/or hygiene programs in low-income countries. By choosing Thankyou, you're helping to fund community selected, owned and managed solutions that best respond to communities' needs like water wells, rainwater harvesting systems, filters, gravity-fed water systems, safe toilets and/or hygiene education. We've helped fund water and sanitation services for 556,300 people (as of March 2018), and that number keeps growing every day. So thank you.